WARNING: This article contains images that may be deemed disturbing or offensive to some. Viewer discretion is advised. Chew, Chaw, Snuff, Dip- all words for chewing tobacco, all part of Penn Manor’s underground world of dip. Cigarette smoking among teens declined from 36 percent to merely 20 percent from 1997 to 2007. However, smokeless tobacco use is growing among high school teens across the country. Penn Manor is no exception. Students here estimate the use of smokeless tobacco by their peers ranges from 15 to 50 percent of male students in the high school. 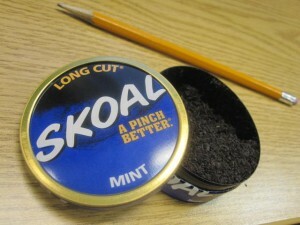 Smokeless tobacco use rises among American teens. While the real total may never be known, school officials are not convinced it is a problem. Students who use smokeless tobacco, however, are so secretive with their practices, it may be masking how widespread the problem really is. Students spoke to reporters with the request their identities remain anonymous. “Best way to hide it is to put it in the side of your mouth. It needs to be a small dip,” said one user. “ I dip in school and spit on the floor,” said another regular chew user. They are not the only ones at Penn Manor who have used chewing tobacco but managed not to get caught with it. And despite the health risks, many students say the benefits they get from “chew” outweigh those risks. Students say they use chewing tobacco for different reasons, such as not smoking but still getting that nicotine kick in school. And there are other reasons. “I dip because my friends do,” said one student. “I caught my brother chewing so I started,” said another Penn Manor student. “I started when I was at (a sports) camp,” another noted. One student also said that he started dip to try to quit smoking cigarettes, even though chewing tobacco cans clearly warn that chewing tobacco is not a healthy alternative to cigarettes. Chewing tobacco can lead to lesions in the mouth, which can lead to mouth and throat cancer, say health officials. It seems even the deadly diseases that may be caused by the product aren’t a deterrent to dippers at Penn Manor. “I just don’t care (about the effects),” one student remarked. “I’m not scared of cancer,” said another chewing tobacco user. That disregard for the dangers of dip and chewing tobacco follows a national trend documented by Legacy Health, a national reporting organization which has followed tobacco use among youths for the last 35 years. 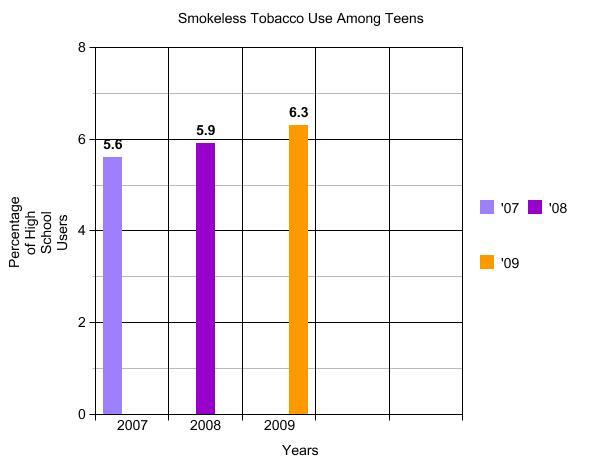 According to Legacy Health, the perceived risk of using smokeless tobacco products also has decreased in all grades– a troubling trend indicating teens are not fully aware of the harm smokeless products can cause and are also not aware they are not a safe alternative to cigarette smoking. While kids may think smokeless tobacco is a healthier alternative to cigarettes, it is not. In addition to cancer risks, according to the American Cancer Society, the use of smokeless tobacco also has been linked to heart disease and stroke. After being shown a picture of a young man with his jaw removed because of chewing tobacco, many users at this school still didn’t have a change of heart. “I think that (photo) is funny,” said one student. “That (photo) doesn’t bother me,” remarked another. One student did find the photo alarming. “I’m quitting right now,” he said as he looked at the gruesome picture. There were a dozen students interviewed for this story who were not occasional users but who “dipped” at least once a day. “I use a can a week,” said one of those users. School Resource Officer, Jason Hottenstein, explained the school’s consequences for the use of chewing tobacco are the same as for cigarettes. There is a $10 fine for having the product and a $25 fine for use of the product. Apparently the fine does not seem like a steep price to pay for a kick of nicotine to many students. “I don’t give a [care] about getting caught, I need my buzz,” a student remarked. Hottenstein explained that officials have various ways to catch students with smokeless tobacco in school. According to another medical website, www.cancer.org, while chewing tobacco is less lethal than smoking, it can still be deadly. Tobacco use was the number one preventable death along with high blood pressure. More than 800,000 people died in 2005 of tobacco-related causes. The facts are out there, yet kids are in Penn Manor have not been deterred. Would dipping ever come to a halt at Penn Manor?